The looming death-spiral of the motorcycle world and its dire need to lure in millennials has been a hot topic discussion as of late, and the issues are abundantly clear in the industry’s most well-known brand. According to Bloomberg, Harley-Davidson is witnessing a sharp decline in sales of just about everything right now. Jewelry, shirts, do-rags—sales are down across the board, the company’s revenue continues to dip, and now layoffs are forthcoming. 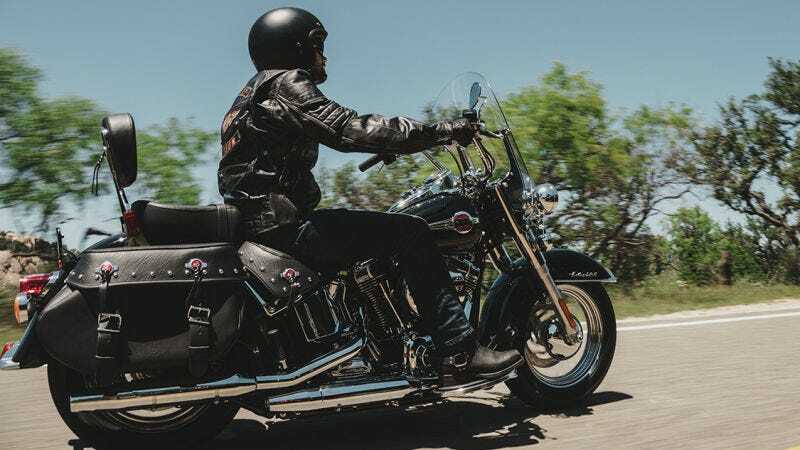 Harley posted a quarterly update on Tuesday, and as Bloomberg reports, the company reported a drop in general merchandise revenue of 17 percent, a less-bad-but-still-really-bad drop from the first quarter, when a 21 percent drop in merch revenue was recorded. And while merch revenue accounts for only 5 percent of Harley’s revenue, Bloomberg says, it’s a sign that the hogs are losing admiration from the world. For those who own Harleys already, these tchtochkes are a go-to for relatives and friends every Father’s Day, Mother’s Day, and Christmas. Among those who don’t ride, a Harley leather jacket is an affordable entrez to the club, not unlike a pair of Ferrari driving loafers. And one would think there would always be a bullish market for deluxe leather riding chaps ($275). The company no doubt is far more alarmed about the disappearance of motorcyclists—as it should be. In the first half of the year, U.S. registrations of large motorcycles declined by almost 7 percent, according to data released Tuesday. Harley, meanwhile, cut its sales forecast and laid out plans to fire factory workers. As boomers—which represent a huge chunk the market—transition from the roadhouse to the retirement home, every bike-maker in the industry is trying to lure young customers with smaller bikes. As a result, the company’s planning to cut jobs, though a total number wasn’t immediately clear. Harley’s projecting a dire outlook for the remainder of 2017, but the company says those pesky young folks sees a bright spot: they’re buying used bikes in “encouraging” numbers, reports USA Today—they just need them to purchase a new motorocycle. “It’s up to us to inspire even more of them to ride and to engage with Harley-Davidson’s products and experiences,” company CEO Matt Levatich reportedly said. Harley’s cooling cool-factor comes as it’s vying to scoop Italian sport bike company Ducati. A bid was supposed to be submitted some time this month, but it may be awhile before we see a chrome-covered hog in stores next to a Ducati Diavel.